Does anyone have suggestions on the best linen fabric to use for the shirt and the best materials to us in creating the tassels? I know there are complete shirts available out there, however, the majority of Jack's wardrobe is being custom made and I would like to do the same with the shirt. Thoughts and Suggestions would be greatly appreciated gents? The fabric you want for the shirt is a medium weight linen 4.5-6.5 oz. in a cream color. White is ok, too, particularly if you find it at an exceptional sale price. You will just need to tea dye it more heavily. 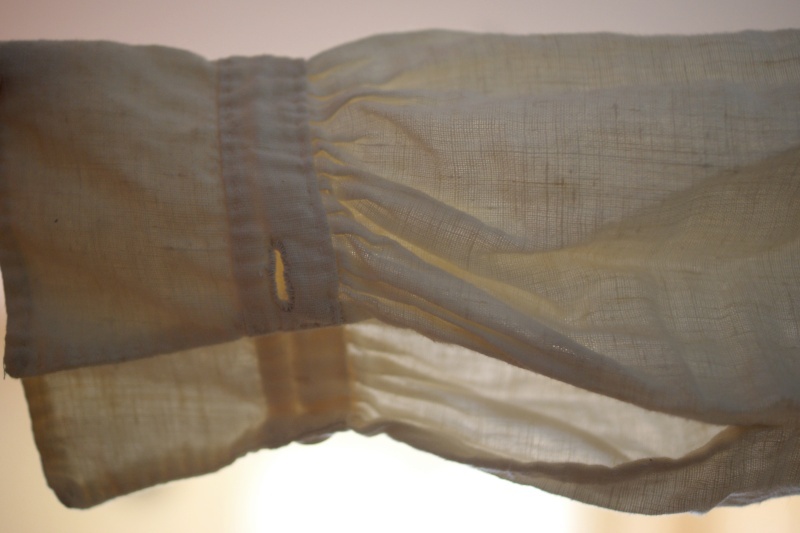 There is a handkerchief weight linen, but it is too sheer. I would advise buying the linen online since it's a generic color. 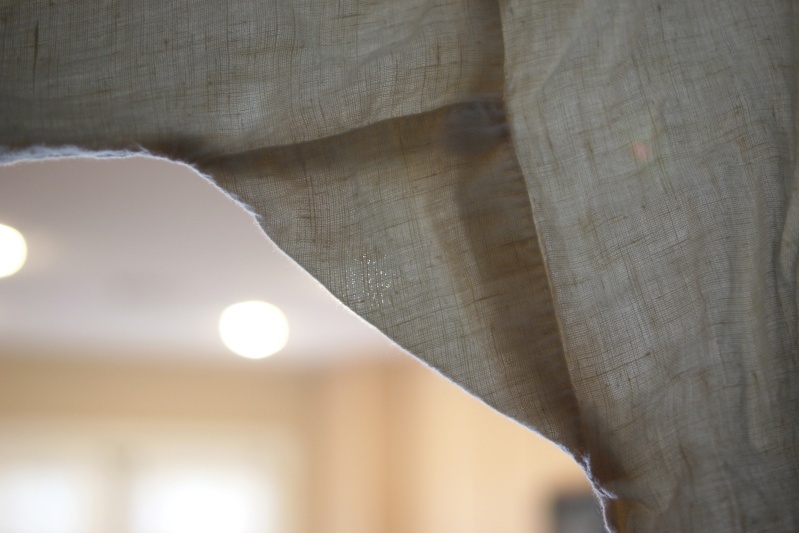 You can often find 3 or 4 yards of the linen you need on ebay for $5-$7/yd - much less expensive than in a fabric store. 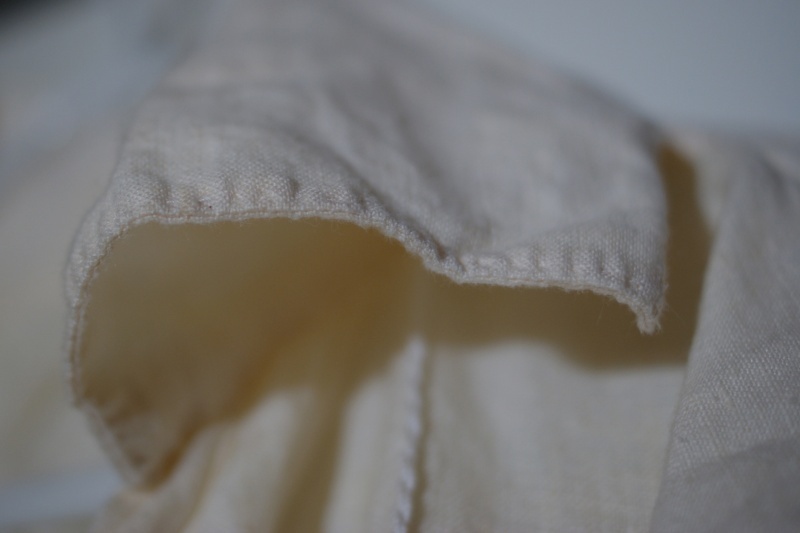 Linen shrinks the first time you wash it so buy some extra fabric and pre-wash it in hot water and then dry in a very hot dryer. If you get it out of the dryer quickly, it won't wrinkle too badly so you can get away with not ironing it before cutting the pattern pieces out. 1/2 yd extra should be plenty and still leave you with enough extra fabric to practice tea dying on the scraps before dying the actual shirt. 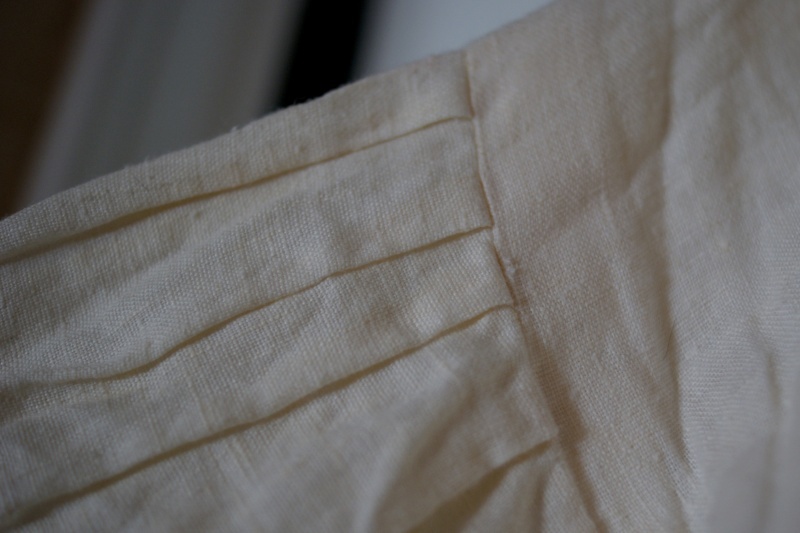 Linen gets softer every time it is washed so by the end of the weathering process, it should be very comfortable. And it's more durable than cotton so it's worth getting linen. This is the pattern I used, with some modifications. http://www.amazon.com/Shirt-1790-1830-English-Style-Pattern/dp/B005V64VQ2/ref=cm_cr-mr-title The front opening on this pattern is the perfect depth as is. The collar is also perfect as is. I did need to create a sleeve cuff and make the wrist band in the pattern thinner. I also created tiny pleats at the neck, shoulder and cuffs rather than the gathers indicated in the pattern. 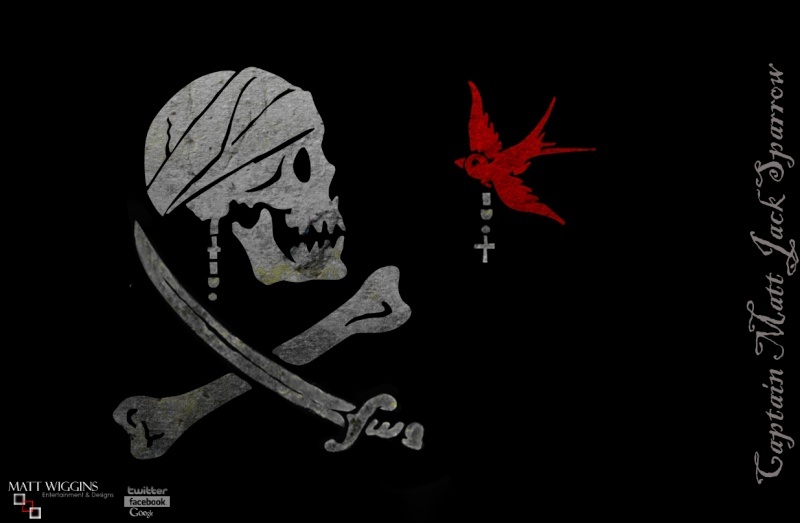 It matches the screen version much better. There are several other patterns available that would probably work fine. Historical patterns are strange to work with at first because they have gussets, for one thing. The underarm gussets make the shirt fit properly when worn with a waistcoat. I advise basting the shoulder seams, side seams and underarm gussets and then trying it on before sewing the final seams as I had to do some adjusting to the fit in that area. Measure around the neck of the shirt and then add 16" x 2. That is the length of cording you need to make. Create your twisted cord by using this tutorial: http://www.slideshare.net/kootoyoo/how-to-make-twisted-cord-presentation There are also lots of twisted cord videos on YouTube. 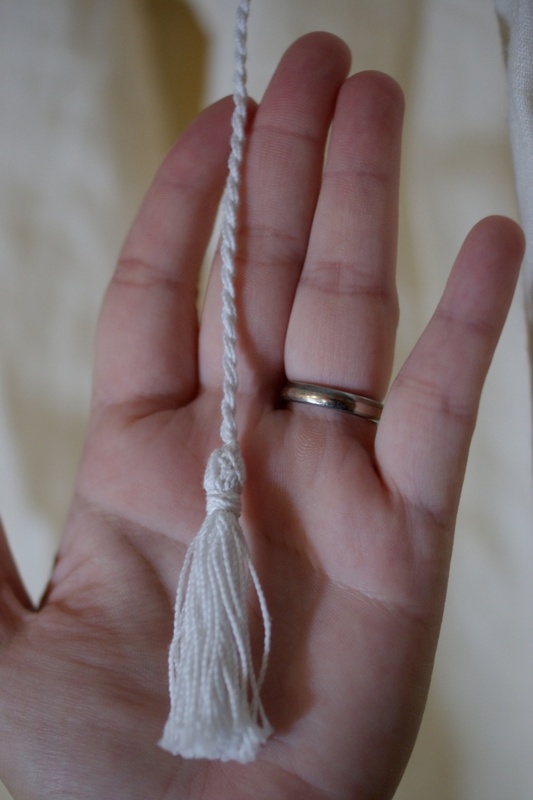 Create the tassels as shown in this tutorial: http://pasticheknits.blogspot.com/2013/07/monks-cord-tutorial.html Even though she demonstrates making the cord and tassels using knitting yarn, the process is exactly the same with the thin cotton thread. After you've made the cord with the tassels on each end, tack stitch it to the back of the shirt under the collar - from shoulder seam to shoulder seam. Don't tack it at the front of the shirt. 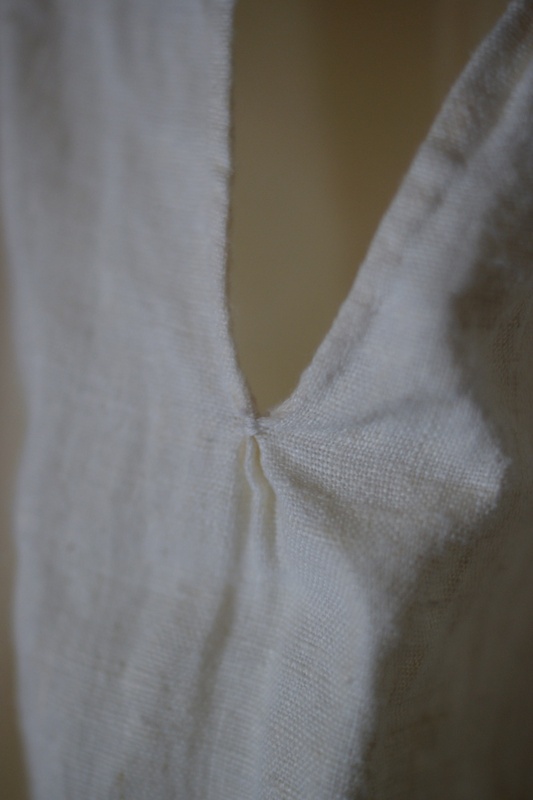 It hangs freely from where the shoulder seam meets the collar. The first time you make this particular pattern, expect it to take a couple of days from start to finish. A second shirt takes much less time because you've figured out how the pattern works. My apologies if this is way more than you wanted to know and I hope it helps. It's very lightweight linen - probably more of an ivory shade than cream, but by the time it's weathered you'll hardly notice. CotBP is more yellow, but OST is really just very dirty dirty white so I'd steer clear of any tea staining. Thank you so very much for this informative reply! I love this site, however, it is difficult, at times, to get anyone to help out with the questions posted. I really appreciate you taking the time! I will absolutely use the information you have posted and I LOVE the details - I am all about the details so no need to be concerned about the length of your response. Many of my posts are probably tremendous overload for some! LOL When your passionate about something - the "can't help it's" have a tendency to take over! Thank you as well Button It! I am looking forward to moving forward with my shirt journey - and the many other pieces to the ongoing puzzle! Thank you so much for your kind words, Captain Matt. It's true - I get very excited about a project that has turned out well. It's hard not to, isn't it? I hope to hear how your own custom shirt project progresses. My lovely daughter-in-law took some very good close-up pictures of the shirt construction so I am posting some here in case they will be helpful to you or someone else. 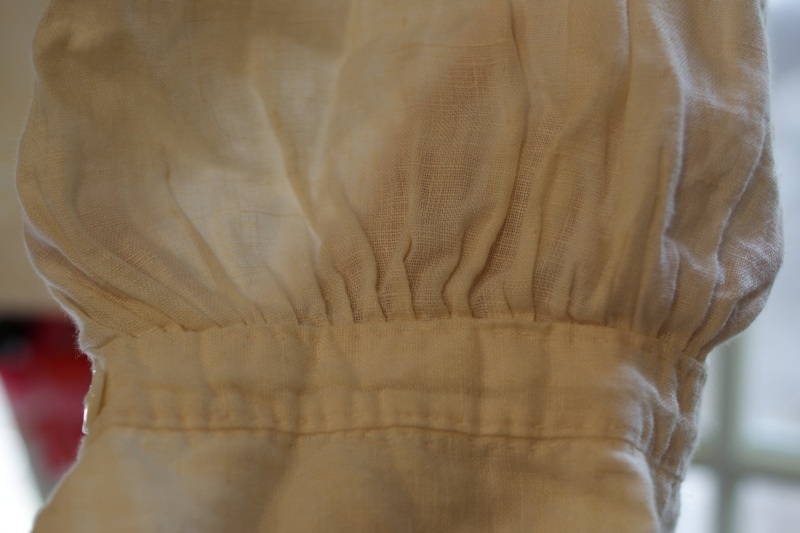 They illustrate better the underarm gussets and pleats rather than gathers, which are unique to historical shirt patterns. The hand stitching at the collar and cuffs and neckline could be added to a ready made shirt and would look great, IMO. Outstanding detailed photos mate! Very helpful!